The generosity of the Gilbert Greenall Chapter No 1250 brought a smile to many faces when memory loss people started to remember songs and music from yesteryear. It is a well-known fact that those who suffer from memory loss due to dementia, benefit enormously from listening to the music they enjoyed during their youth. Pictured from left to right, are: Wendy Cook, Chris Todd, Andrea Parr, Chris Betts and Andrew Devlin. 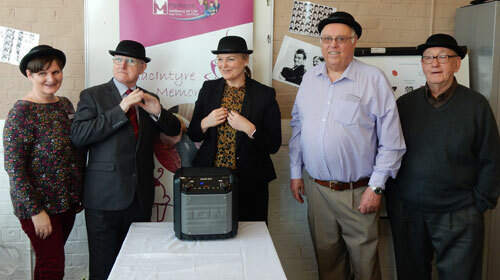 However, when Chris Betts started taking his wife Pamela (who suffers from Alzheimer’s) to the MacIntyre Memory Café held at the Fairfield and Howley Community Centre, Fairfield Street, Warrington, he noticed that the music was provided via an ancient record player and a handful of old vinyl records. When the Gilbert Greenall Chapter companions heard about this, they immediately agreed to donate a device which would not only modernise their equipment but extend the musical and audio facilities available at the café. They therefore, donated a powerful rechargeable battery powered wireless (Bluetooth) speaker system which would allow music on various devices such as smartphones, tablet computers and laptops to be played, as well as provide audio microphone capabilities for other events, including external occasions. The first use for the speaker system was in the showing of a Laurel and Hardy film for which it provided excellent audio sound. On this occasion and to add a little extra authenticity some Laurel and Hardy hats were available! The presentation of the speaker system was made by Chris Todd (first principal), Chris Betts (third principal) and Andrew Devlin (chapter member). The donated equipment was gratefully received by Wendy Cook (senior administrator) and Andrea Parr (area manager). Story and picture by Chris Betts.